Anarchism was the driving force behind the Trade Union movement in Cuba in the 1880s, organising among the tobacco and sugar cane workers. Anarchists later had to fight against both Batista and then Castro’s ‘revolutionary’ government. Many were forced to flee into exile, while those who remained faced the brutality of the ruling regime. After many years of repression the anarchist movement is reawakening. One of the emerging groups is the Taller Libertario Alfredo Lopez (TLAL) from Havana. 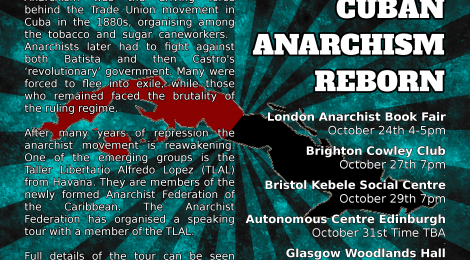 They are members of the newly formed Anarchist Federation of the Caribbean. The Anarchist Federation has organised a speaking tour with a member of the TLAL. You can help support the fundraising effort to purchase a social centre in Cuba. The total needed is US$11,000. Please make donations to support purchase of premises at https://www.gofundme.com/gg2wrcac (scroll down the page for an English translation).